Similar risk of infection! Meta analysis and systematic reviews show no sig diff in clabsi! Don’t place, or leave in place, peripherally inserted central catheters for patient or provider convenience. Peripherally inserted central catheters (or “PICCs”) are commonly used devices in contemporary medical practice that are associated with two costly and potentially lethal health care-acquired complications: central-line associated bloodstream infection (CLABSI) and venous thromboembolism (VTE). Given the clinical and economic consequences of these complications, placement of PICCs should be limited to acceptable indications (long-term intravenous antibiotics, total parenteral nutrition, chemotherapy and frequent blood draws). PICCs should be promptly removed when acceptable indications for their use ends. So next time someone recommends a PICC over a central line, think about the indications and necessity! Do you know the water content of your sevo? An incident of Lewis acid mediated sevoflurane degradation occurred in 1996.5,6 Several bottles of sevoflurane had cloudy drug, a pungent odor, marked acidity (pH <1), and high fluoride (863 ppm), all indicating substantial anesthetic degradation and formation of HF, in quantities far exceeding the safe limits of 3 ppm over an 8 hr average. Abbott subsequently determined that increasing the water content in sevoflurane formulations decreased Lewis acid-dependent sevoflurane degradation.7 They changed the sevoflurane formulation to contain at least 300 ppm water, in order to prevent Lewis acid degradation and formation of toxic degradants. The new “water-enhanced” sevoflurane formulation was approved later that year by the U.S. Food and Drug Administration (FDA), and awarded patent protection. Anesthesia was induced with propofol and either remifentanil 1 microg/kg or sufentanil 0.25 microg/kg. Propofol was continued using a target-controlled infusion (TCI) system. Maintenance infusion rates for remifentanil and sufentanil were 0.25 and 0.0025 microg.kg-1.min-1 [or 0.15mcg/kg/hr for sufenta] respectively. 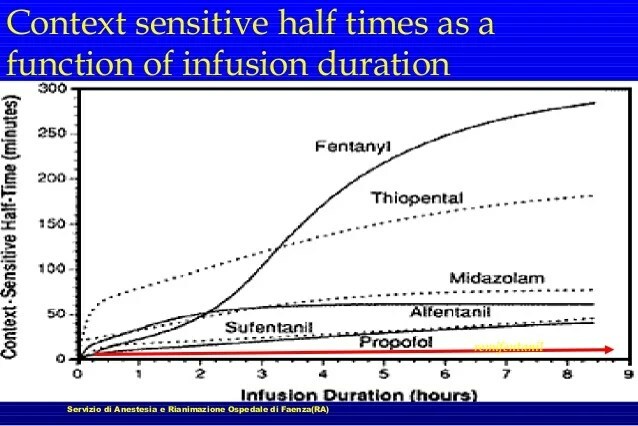 The median extubation time was similar in the remifentanil and sufentanil groups (10 minutes [interquartile range, 5-19 minutes] and 16 minutes [interquartile range, 10-30 minutes], respectively). Remifentanil was associated with the need for significantly fewer adjustments to maintain hemodynamic stability compared with sufentanil (0.8 vs 2.1; P=0.037), greater use of postoperative morphine (44.8% vs 22.6% of patients, P=0.01; mean IV morphine dose per patient: 4 vs 1.3 mg, P=0.016), and higher intraoperative opioid costs per patient euro vs euro P<0.001). The incidence of PONV did not differ significantly between groups.